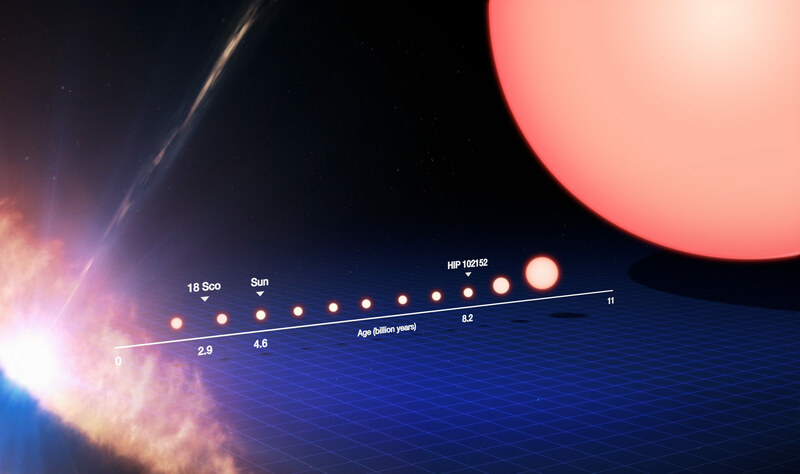 This image tracks the life of a Sun-like star, from its birth on the left side of the frame to its evolution into a red giant star on the right. On the left the star is seen as a protostar, embedded within a dusty disc of material as it forms. It later becomes a star like our Sun. 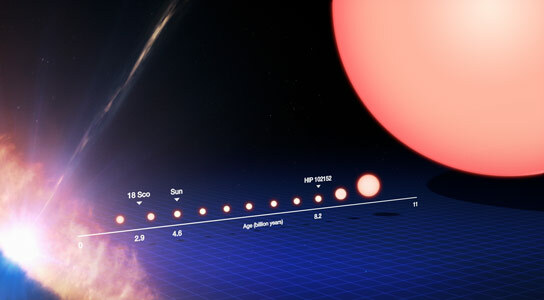 After spending the majority of its life in this stage, the star’s core begins to gradually heat up, the star expands and becomes redder until it transforms into a red giant. Using ESO’s Very Large Telescope, astronomers have identified the star HIP 102152 as the oldest solar twin known to date. The team studied two solar twins  — one that was thought to be younger than the Sun (18 Scorpii) and one that was expected to be older (HIP 102152). They used the UVES spectrograph on the Very Large Telescope (VLT) at ESO’s Paranal Observatory to split up the light into its component colors so that the chemical composition and other properties of these stars could be studied in great detail. Many people have heard of the twin paradox: one identical twin takes a space journey and comes back to Earth younger than their sibling. Although there is no time traveling involved here, we see two distinctly different ages for these two very similar stars — snapshots of the Sun’s life at different stages. Previous studies have indicated that a star’s lithium content could also be affected if it hosts giant planets (eso0942, eso0118, Nature paper), although these results have been debated (ann1046). If a star contains less of the elements that we commonly find in rocky bodies, this indicates that it is likely to host rocky terrestrial planets because such planets lock up these elements as they form from a large disc surrounding the star. The suggestion that HIP 102152 may host such planets is further reinforced by the radial velocity monitoring of this star with ESO’s HARPS spectrograph, which indicates that inside the star’s habitable zone there are no giant planets. This would allow the existence of potential Earth-like planets around HIP 102152; in systems with giant planets existing close in to their star, the chances of finding terrestrial planets are much less as these small rocky bodies are disturbed and disrupted. Be the first to comment on "Astronomers Identify the Oldest Solar Twin Known to Date"